We decided to put an end to the misery of the tomato plants this week. We felt that given the weather, there were not all that many tomatoes that would actually reach the point of maturity where they could even ripen off the vine. We ended up with one large bag of ripe tomatoes, 2 large bags of green tomatoes that were unlikely to ripen, and 3 trays of tomatoes that I thought would ripen. The garden is clearly different with the tomatoes gone! We also snipped the remaining squash plants off at the ground so that we could more easily take them off the trellises next week. 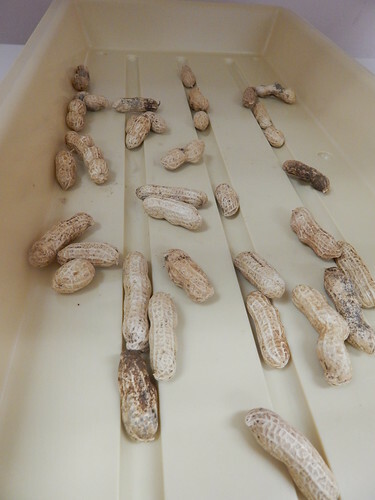 We also harvested about 2/3 of the peanuts this week. We have set them to dry for roasting later on. The yield wasn’t as high as we had hoped, although many of the pods were nice sized. One of the reasons that the yield wasn’t what we might have wished is that our heirloom peanut varieties were a lot taller and lankier than we had expected. 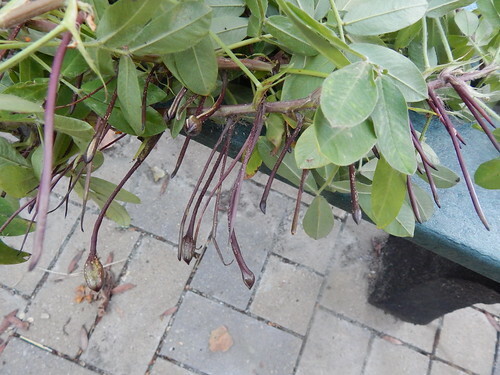 This meant that when the flowers bloomed and produced the “pegs” (the ovary bud, which are the purplish stem-looking things in the picture), the pegs couldn’t reach the soil and produce peanuts. We could have had dozens more peanuts! So, the moral of the story is that we should either have chosen a modern variety with shorter plants where the flowers occur closer to the base OR we should have planted the heirloom varieties in a spot with more space to flop over and reach the soil. Now we know! 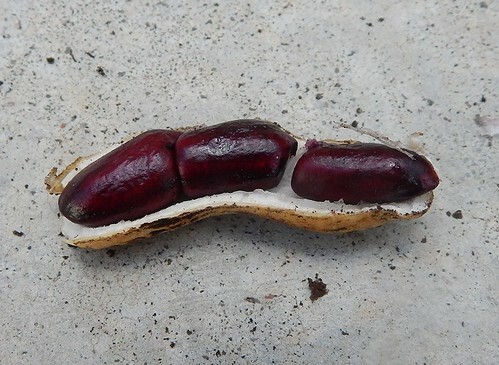 The ‘Schronce’s Deep Black’ peanut has rich purple colored skins on the peanuts before drying. I washed the pods and have layed them out to dry for the time being. No, this isn’t the entire harvest! One of the Master Gardeners took the rest home to wash, dry, and roast for us to try later. I wanted to keep a handful to show on the blog. I also have our ripening tomatoes in a couple trays in my office. The warmth will ripen them faster than if they were in a slightly cooler (55 degree) setting. Some of them have ripening quite a bit just this week. The way you can determine if a green tomato will ripen is to look at the blossom end. 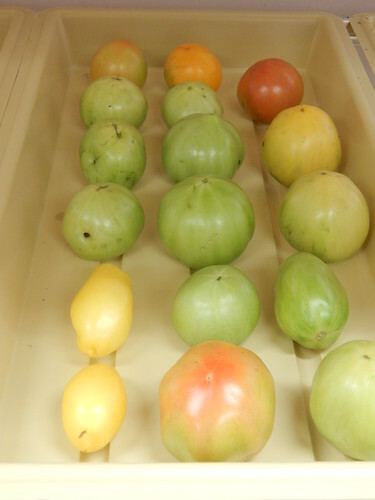 A “mature green” tomato will have a white star at the blossom end, as you can see on the tomato above. A tomato will also typically start ripening from the blossom end, so if there is even a tinge of color there, it will ripen. It is important to make sure that you cull out any damaged fruit and set the fruit so they aren’t touching to prevent any rotting. 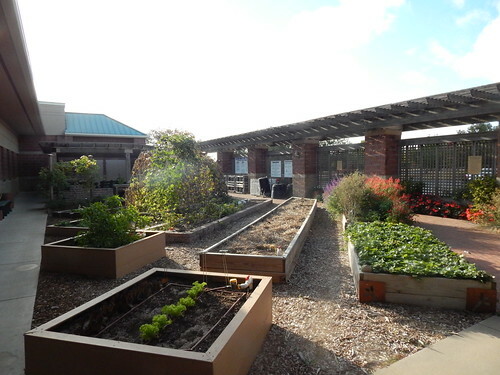 The cooler the temperature of the place you put the tomatoes, the longer they will take to ripen. 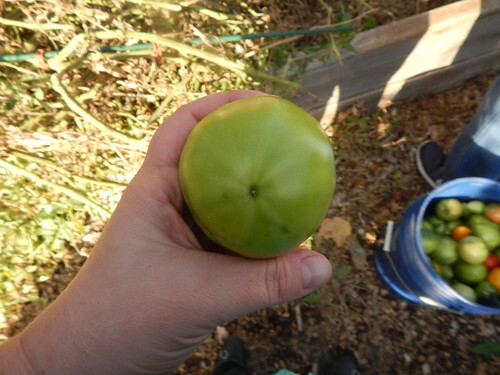 If you want garden tomatoes for Thanksgiving, you should be able to stretch the ripening out! 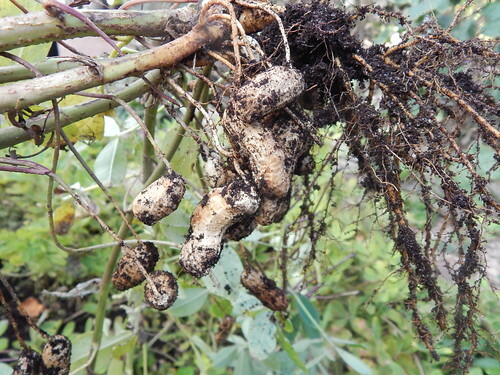 Posted on October 23, 2015, in PhotoEssays and tagged fall, garden, peanuts, Tomatoes. Bookmark the permalink. Leave a comment.